The Oyster Olympics, held in Seattle on the last weekend in March, is a thinly disguised excuse to indulge in huge quantities of this most delicate of sea foods. The competitors, being sponsored for an environmental charity, compete in their “shucking” and their “slurping” but the winners seem to be the ones who know best how really to enjoy an oyster. A favoured method is to eat it ‘naked’. “Using your shellfish fork, make sure the raw oyster is completely detached from its shell. Admire its beauty, grace and freshness, grasp the oyster shell comfortably, cradling it in the nook between your thumb and first two fingers, lift the shell to your lips and, in one swift move, tip up the shell and slurp both the oyster and juices into your mouth. Relax and think of the ocean. 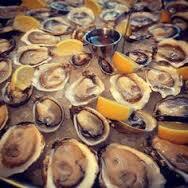 Savour the high note of briny freshness and caress the oyster with your molars a few times before swallowing”. Such detailed and attentive appreciation can be applied to many aspects of life. Making the ability to find such exquisite enjoyment of all that life offers an “Olympic” event is quite appropriate because it’s as we learn to savour all that life offers that we strike gold. Easter is a celebration of the gift of new life. Christ’s rising from the dead was an affirmation of the power and beauty of Life itself and of its ability, when imbued with God’s energy and love, to overcome anything that threatens it. Lent has been a time of preparation, of sifting the ingredients that contribute to a rich and tasty life and of mixing them in a way that results in the unique individual that each of us is. What’s left now, and it’s perhaps the best way to express how highly we value the gift of life, is simply to savour every mouthful. Rejoice: that Christ defeats all that threatens to undermine our ability to make the most of the lives God’s given us. Reflect: What changes could I make in my way of living that would help me savour life more thoroughly? Remember: that small changes are often the beginning of bigger ones. Resolve: to let Christ lead me into an abundance of joy.